This is the comprehensive study guide that has been instrumental in helping thousands of counselors pass the National Counselor Examination (NCE) used for state licensure. It will help you assess your weaknesses and strengthen what you know. Dr. Arthur's Study Guide is available in either a hard copy or eBook format, and covers all 8 CACREP content areas. The package also includes a Pre-Assessment Exam and one Practice Exam that are both online, each with 200 questions and detailed answers that give insight into the style and format of the NCE's questions. Our Enhanced Package includes two additional online exams (each 200 questions) which provides ample opportunity to gain confidence in your knowledge base. See What You Get and get started. The heart of the program is Dr. Arthur's Study Guide for the NCE, which is a user-friendly publication designed to prepare you for the exam. The Study Guide has been updated for the DSM-5™ and 2016 CACREP Standards. The Study Guide is organized according to the 8 CACREP areas: Professional Counseling Orientation & Ethical Practice; Social and Cultural Diversity, Human Growth and Development, Career Development, Counseling and Helping Relationships, Group Counseling and Group Work, Assessment and Testing, and Research & Program Evaluation. Example questions reflect those objectives. This is significant because the NCE is developed from CACREP programs. Up to four online exams available, each with 200 questions and detailed answers. One of the online exams is a pre-assessment exam, which helps you prioritize your studying based on your results in each of the 8 CACREP areas. Our Basic Package also includes one practice exam, or purchase the Enhanced Package to access a total of three practice exams. The online exams may be taken multiple times for up to a full year, allowing you to study at the pace that is best for you. As part of either purchased package, you can schedule a personal consultation with Dr. Gary Arthur for up to 30 minutes. Pass the NCE or the purchase price will be refunded to you. See guarantee policies for details. Dr. Arthur's NCE Study Program boasts a 93% pass rate versus the national average of 72%. You get a personal profile page containing status of exams you have taken, links to your online study materials, ebook downloads, your purchases, and access to more materials. * Two additional practice exams can be purchased later for $60. ** Must purchase Basic or Enhanced Package to buy Optional Hard Copy for $57.45. See Optional Enhancements on Checkout page. If you require we ship to a PO Box please call toll free 888-326-9229 for details. Price includes production & shipping costs. This hard copy contains the same information that is found in the online Study Guide and eBook included with both packages. Dr. Arthur occasionally offers live, interactive, in-person workshops. ** Must purchase Starter or Full Package. See Optional Enhancements on Checkout page or can be purchased each later. The below policies are applicable to the Dr. Arthur’s Study Guide for the NCE National Counselor Examination. CTC offers a money back pass guarantee for the Dr. Arthur's Study Guide. Pass the NCE, or CTC will refund your money for the cost of the Study Guide (excludes shipping and any sales tax). The Study Guide must be purchased at least 30 days, and not more than one year, prior to the exam date. If the exam is failed, the customer has 90 days to forward a copy of proof of failure to CTC. If the hard copy was ordered, the NCE Study Guide must be returned. Note: The return expense is the responsibility of the customer. Once CTC receives the exam scores (and Study Guide if ordered), CTC will refund the credit card originally used via our online payment service (excludes all shipping charges and any applicable sales tax). The credit should appear 5-10 business days from the processing date. The customer has 3 days from the purchase date to review the purchased online services, including online exams and eBook, to confirm that it is what he/she expected. If the customer has purchased a hard-copy of the NCE Study Guide, he/she has 3 days from the date of delivery of the Study Guide. If unhappy with the content for any reason, the customer is required to notify CTC within 3 days either by phone or e-mail that he/she is requesting a refund and will be returning the Study Guide, if applicable. Further, to qualify for a refund, the customer may not have taken any part of any of the online exams; they are allowed access for review only if they wish to request a Satisfaction Guarantee refund. Upon proper notification, CTC will turn off access to these online services, and a refund will be issued. For those customers who have purchased the hard-copy, it is required the hard-copy Study Guide be returned to CTC in good condition. Once CTC has received the hard-copy, a refund will be issued (excludes all shipping and any applicable sales tax). Note: The return expense is the responsibility of the customer. For questions about the above policies, or any aspect of the Study Guide, please call toll free 888-326-9229. I am very happy to share that I passed the NCE. Not only did I pass it on my first attempt, but I scored 124 when I only needed 91 to pass! Utilizing the study guide along with the 3 practice exams helped build my confidence. The study guide was easy to follow and allowed me to focus on one concept at a time. I am very grateful for CounselorExams.com's study materials; it was well worth the investment! Gary Arthur's Study Guide is the single most powerful tool anyone can use to prepare for the NCE. The material is extremely well organized and accessible, the text is highly readable, and the information is precisely focused on what you need to know. Gary's study guide helped me develop a successful test-taking strategy and gave me a clear approach for studying for the exam. The practice examinations gave me an effective chance to test my knowledge. I recommend this study guide to all the students and associate clinicians I supervise. I could not have passed the NCE without Dr. Arthur’s workshop, course materials, and practice tests. They were invaluable to me as they help me to make a 126! I would highly recommend anyone preparing for the exam. Hi Dr. Arthur! Just want to share with you that I passed the NCE and I believe your prep materials had everything to do with it. The Study Guide was a great re-cap of the Master's of Science classes. 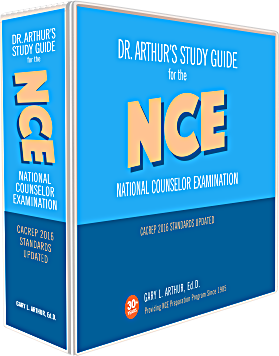 I am delighted to report that I PASSED my National Counselor Exam by using Dr. Arthur's NCE Study Guide. The Study Guide was comprehensive, well written and easy to understand... and covered all CACREP essentials. The exams after each chapter were also very helpful... the online pre-assessment and practice exams were invaluable! 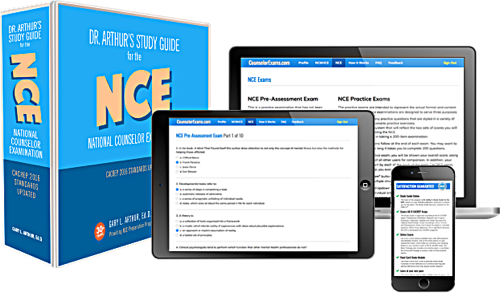 Dr. Arthur's NCE Study Guide is a must have for anyone preparing for the NCE for licensing & certification. The practice exams were instrumental in helping me prepare for taking the actual exam, and I passed it with confidence. I would recommend this to anyone who is preparing for the NCE. Dear Gary, I couldn't have done it without you! Thanks to you and your Study Guide, I passed the examination with room to spare. Thanks again for everything! Just wanted you to know that I passed the NCE Exam last week. The study materials were a big help. I scored 134/160. The cutoff score was 91, so I was well-prepared for the exam.